This video showcases treatment of a patient with congenitally missing front teeth. The patient obtained a iCat® scan and the data was processed and transferred to the Dentsply Simplant® program which worked to develop the placement angles to maximize both esthetics and function. The information was then used to develop a surgical template that as used during the surgery to replicate the planned case. Reviewing the video, it is easy to appreciate the amazing ability of the program to provide patients with the highest levels of implant care. As a periodontist, Dr. Gordon will be able to correct the gum asymmetry as part as part of the patient’s oral transformation. The Yellow Teeth were created to assess the proper position of the teeth. The Blue Teeth are the patients existing natural teeth. The Purple Implant has been placed according to bone and esthetic needs. You are looking at the bone both outside and in cross-section. This patient came to my office following orthodontic therapy to initiate implant therapy to replace the congenitally missing front tooth. Tooth replacement for front teeth such as this is some of the most technically and artistically demanding of the implant procedures that can be performed. 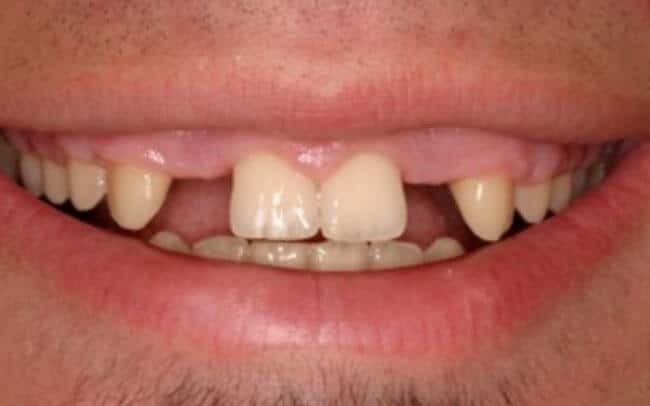 This patient was referred to my office following the discovery that the bridge had failed and that the key tooth holding the bridge was no longer salvageable. This is one of the draw backs of conventional bridgework– decay can occur without easily being discovered with potentially disastrous results. The patient opted not to cut down additional teeth and expand the length of the bridge. The hopeless tooth was extracted and a bone graft placed to preserve the surrounding bone, ultimately allowing the restoration via implants. To replace the two teeth, two implants were applied. This patient came to my office with cavity-riddled teeth supporting a failing bridge. Through advanced implant techniques involving bone grafting, implant surgical guides, and refined prosthetic techniques, the patient was rehabilitated functionally and esthetically. This patient came to the office with an abscess stemming from a crack in the tooth. The tooth was not savable and was extracted. 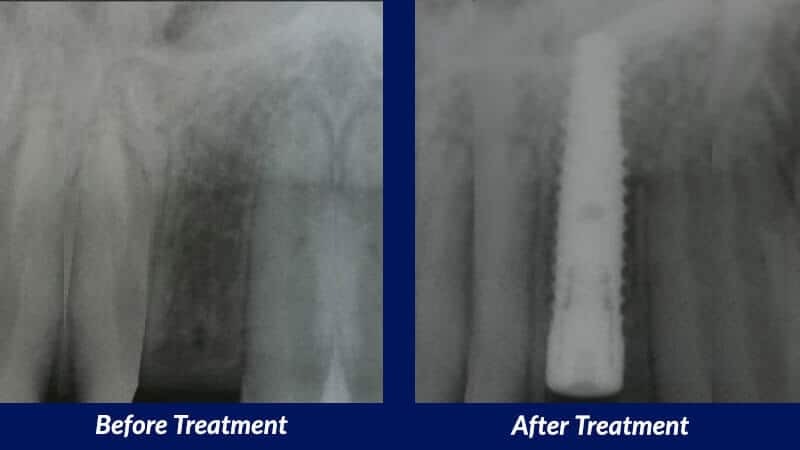 An immediate implant was placed resulting in a fully restored tooth retained by the “synthetic root” [the implant]. The loss of teeth near the sinus will usually result in the expansion of the sinus or there may only have existed a limited amount of natural bone below the sinus. A common procedure involves lifting of the base of the sinus without affecting the sinus itself. The following example is a situation where the existing molar had unresolvable periodontal problems and had to be extracted. A Lateral Sinus Lift with simultaneous implant placement allowed restoration of the tooth without involving additional teeth if a bridge were to be placed. Success rates for implant restored teeth are greater than 95% to last more than 20 years. A typical bridge on average lasts about 8 years before a significant increase of risk for caries and root canal problems can compromise the bridge and require replacement. If problems are not caught early enough, a new conventional bridge may not even be possible. This patient presented with a common problem– cavities under aging bridgework. Many times, there is no discomfort to the patient and the x-rays don’t show the cavities until it is advanced. Periodontal treatment was performed to exposed enough tooth structure for a new bridge to be attached. With refined crown and bridge techniques, a beautiful end result was achieved. This patient was very unhappy with her gummy smile to the point where she would cover her mouth when she smiled. After therapy, this was no longer a problem…. This patient presented with a smile that was unaesthetic because of too much gum being shown. Ideally, no or only a minimal amount of gum should be showing on a full smile.